Spring is in the air. 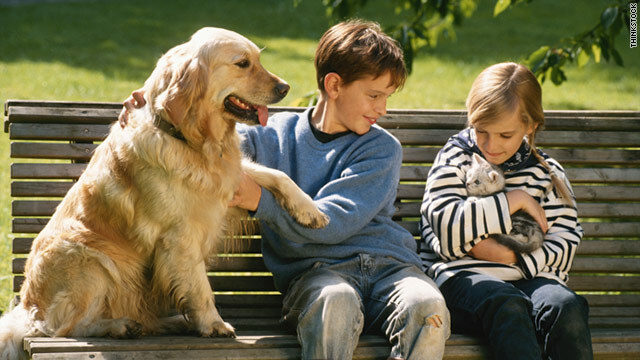 Did you know that your pets could have allergies, too? (MNN.com) -- Spring is just around the corner -- a time when many of us simply dust off the neti pot or load up on Benadryl in preparation for allergy season. It's a little harder for dogs and cats with environmental allergies to avoid the elements. Fortunately, our experts offer cool tips to help keep hot spots and other problems at bay during allergy season. Itchy pets are hard to ignore. "We'll hear owners say 'they kept me up all night because every five minutes they were chewing, chewing, chewing,'" said Dr. Andrea Dunnings, owner of East Atlanta Animal Clinic, who notes an increase in pets with skin allergies this time of the year. Allergy symptoms in dogs can include excessive licking, redness ("hot spots") or hair loss. Dr. Drew Weigner, a board-certified feline veterinary specialist and owner of The Cat Doctor in Atlanta, says that few cats actually suffer from seasonal allergies; they simply sneeze more due to physical irritation from pollen. But cats with true allergies will typically show signs of hair loss and have scabs or open sores. Discharge in a cat's ears or excessive scratching also are common symptoms. Allergy season for dogs and cats can mirror that of humans, so bookmark the pollen forecast in your area and monitor your pets for symptoms. After tiptoeing through the tulips, Dr. Robert O. Schick, a dermatologist with Georgia Veterinary Specialists, suggests wiping your dogs' paws with a cool towel to remove pollen residue or scheduling a weekly cool water bath. Also, help all the animals (and humans) in your house and avoid tracking pollen into the house by removing your shoes at the door. Do what you can to reduce the amount of dust in your home by vacuuming carpets well. Focus on your pet's favorite spots in the house such as under beds and near windows. Don't forget to clean window treatments regularly. Dunnings also suggests removing bedding and washing it on a regular basis using a gentle detergent that is free of dyes or perfumes. Schick offered another cool tip: When your cat isn't looking, ice the mouse every now and then. Freezing plush toys kills dust mites. Also, "Google 'mite control' and you will find several powders that you can add to the carpet to remove mites," he said. "Not all over-the-counter medications are safe for use of pets," Dunnings said, noting that many dog owners use Benadryl to help relieve some of the itching and scratching. The antihistamine "typically makes the pet kind of drowsy, reducing itching because they are sleepier," she said. But it's easy to miscalculate the appropriate dosage for Chihuahua versus a Great Dane. Victoria Park, owner of Park Pet Supply, sees her share of frazzled dog owners in search of help this time of the year. She has found success with all-natural products that are free of parabens and phthalates. Creams that contain hydrocortisone and oatmeal-based shampoos also can help relieve itching, Dunnings said. For cat owners, it's not that simple. Dr. William Carlson of InTown Animal Hospital in Atlanta said soap-free allergy shampoo and cool water can relieve symptoms by reducing pollen and mold spore counts on the cat's skin. But that means getting a cat into a tub, which may be the hardest task of all. An intradermal skin test (allergy test) will help your vet determine the cause of your pet's symptoms. The test is usually conducted by a veterinary dermatologist, and involves shaving a patch on the skin and injecting various allergens such as grass, pollen or dust. Through process of elimination, the vet can isolate the allergen and plan a course of action such as allergy shots or a vaccine. Keep in mind, treatment can be costly -- the test alone may cost more than $200. In cats, regular steroid injections can safely and effectively relieve symptoms, said Weigner. But he noted that potentially serious side effects make this option the least desirable form of treatment. Another option is prescribing an oral medication called Atopica. "It works by suppressing helper T-cells, thus reducing inflammation," Carlson said. "It has clinically been shown to be safe and very effective." One flea can wreak plenty of havoc, so maintain your pet's monthly flea and tick treatment, especially if there is a chance your animal is allergic. Topical solutions such as Advantage and Frontline are popular because you simply apply a liquid solution once a month. Reports of adverse reactions from topical flea solutions caused the Environmental Protection Agency (EPA) to pursue more stringent testing and evaluation requirements as well as stronger warning labels. If you are squeamish about topical solutions, consider greener options. Park suggests Natural Chemistry's DeFlea products, which contain a surfactant ("detergent") that dissolve fleas' waxy protective coating. She also recommends essential oils or diatomaceous earth -- a mineral-based pesticide that comes from fossilized water plants. If your pet appears itchy long after the last flower has bloomed, it may be time to focus on the food. Pets can be allergic to grains, proteins or even preservatives, and the symptoms resemble symptoms for environmental allergies. To address the problem in your dog, your vet may suggest a food trial, limiting the dog to a novel protein such as duck, venison or even fish, along with a vegetable. Treats and table food will be off limits until the vet can determine the allergy source. Over time, you can reintroduce your pet to other proteins, using the process of elimination to determine the source. Cat owners have one more option: Omega-3 fatty acid supplements can keep the normal immune barrier of the skin healthy and reduce secondary infections, Carlson said. Of course, cats won't mind getting their omega-3 in the form of coldwater fish such as salmon, trout and sardines either. Morieka Johnson writes about pets, fashion and money-saving ideas for MNN.com. You can follow her on Twitter @MotherNatureNet.